Let's have a minute of silence to honor the victims of 9/11. Five new polls today, two of them significant. Kerry has moved back into the lead in Pennsylvania albeit by less than the MoE so it doesn't mean a lot. The Survey USA poll gives Kerry 49% to Bush's 47%. Picking up Pennsylvania also gives him the 270 votes in the electoral college needed to win. The other significant poll is in Missouri, where Survey USA puts Bush ahead 48% to 46%. Thursday we had Bush up by 14% according to a Gallup poll. I didn't believe that then and I still don't. Gallup clearly messed up, like Time and Newsweek last week. Before believing a strange results, check the state graphs to see if it fits in. Barring major news, jumps of 10% in a week are just not going to happen in this race. Bush has maintained his huge leads in Indiana, Kansas, and Kentucky. 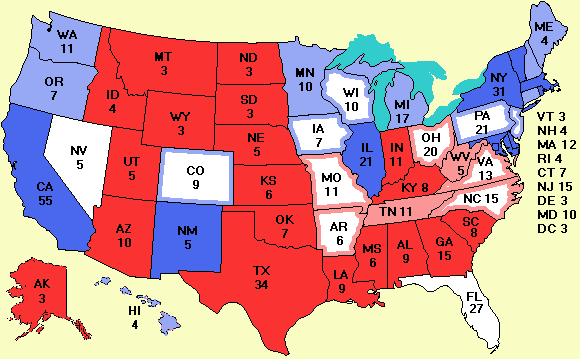 Consequently, neither candidate will set foot in any of these states. I was afraid this was going to happen sooner or later and it has now happened. I have to make a judgement call on a firm that engages in push polling. In case you haven't followed this issue, push polling is where the pollster (on instructions from the client) asks a very slanted question in order to elicit the desired answer so the pollster can announce how well the client is doing. Questions like "Do you support John Kerry even though he lied about getting medals in Vietnam?" or "Do you support George Bush even though he deserted the National Guard during war time?" fall in this category. Legitimate pollsters would never ask such questions. Instead they might ask "Do you believe John Kerry earned his medals in Vietnam?" or "Do you believe George Bush fulfilled his duties in the National Guard?". Those are questions designed to determine public opinion, not create it. Why does this come up now? Moore Information (R) just released a poll showing Bush 9% ahead in Iowa, a state he has never led in before and which the current poll (taken 5 days before Moore's poll) puts Bush 4% behind. On its own merits, this is implausible, but in the absence of other evidence, I would accept it, as I accepted Gallup's poll showing Bush 14% ahead in Missouri (even though I don't believe it for a second) due to Gallup's reputation. Even Gallup can make a mistake, but they are not dishonest. With Moore Information, the situation is different. Moore was recently caught doing push polling, as reported in the Milwaukee Journal Sentinel. It is ok for a pollster to work for one side or the other as long as they do honest polls (Scott Rasmussen is a Republican but I have no reason to question his numbers, for example). But Moore has crossed the line and got caught with its hand in the cookie jar. I asked the president of Moore Information for his side of the story but he didn't respond. Henceforth I will not use any Moore Information polls. If anyone has documented evidence of other pollsters doing push polls, please let me know. In Rasmussen's 3-day rolling averages, Bush currently leads Kerry by 1.6% nationally, but trails him by 2.5% in the 16 battleground states. Ultimately, the latter number may be more important than the former because rolling up a massive victory in the South and West may be slim consolation for losing the Midwest by 2%. Rasmussen also reports that in the battleground states only 39% think the country is on the right track, vs. 56% who think it is on the wrong track. Numbers like these are never good for an incumbent. For those of you curious about the minor parties, I now have some real data. Zogby's Sept. 8-9 survey gives the following results: Bush 46%, Kerry 42%, Nader 2.4%, Badnarik 0.9%, Peroutka 0.3%, Other 0.6%, Undecided 8%. In a two-man matchup, Bush leads Kerry by 2%. I just learned that Zogby is the house pollster for the New York Post, an extreme right-wing tabloid owned by Rupert Murdoch. Having the Post and the WSJ as clients doesn't attest to Zogby's accuracy but it does attest to his not being biased in favor of Kerry. Zogby is also the pollster for Reuters, the largest news agency in the world. There are updates in five Senate races today: Georgia, Indiana, Kentucky, Missouri, and Pennsylvania. It is interesting to note that Senate races often do not track the presidential race at all. Indiana is staunchly Republican, yet the Democratic incumbent there is a mile ahead. Missouri and Pennsylvania are tossups in the presidential race, yet the Republican incumbents are way ahead in both. Often incumbency trumps everything. As an aside, in Oct. 2000, the Senate passed a resolution honoring the seven greatest senators of all time. As a tribute to these great statesmen, their pictures are now on the Senate page. See if you can name them before peeking. The polls still say the new Senate will be 50-50, but if Louisiana goes for a Democrat, as it has for over a century, the Democrats might recapture it. Nader News: I consider Nader to have definitively failed to get on the ballot in the following states: Arizona, California, Georgia, Idaho, Illinois, Indiana, Missouri, North Carolina, Oklahoma, texas, and Virginia. In the others he either made it or the case is in court. I'm actually quite conservative and don't want to write him off until the courts have decided. My $400 ad for Real Clear Politics was rejected. I guess only right-wingers can advertise there. Maybe they don't want their cosy little world interrupted by the truth. This view is enhanced by the fact that they also rejected an ad from www.politicalwire.com, an excellent (and unbiased) site for political junkies.